Do you. Your Voice Matters. “My blog isn’t the typical genealogy blog.” I was grateful that it was dark in the van we were riding in, because my cheeks were getting red as I tried to defend myself to a woman who had been blogging longer than I had. “I have heritage crafts, and personal narratives. I’m writing about facing my 40 fears before I turn 40. It’s hard to explain.” I handed her my card. We had arrived at the party, and everyone piled out of the van. I spent the next 2 hours socializing with other genealogy bloggers and learning more about them before the group of us climbed back into the van we were carpooling in. During our van trip back to the city, with the other bloggers, I shared part of my story. I told them about the important decision 4 years ago my husband and I made to move to the mountains with our 4 boys. I summarized that it had been difficult to go from the top 2% of American wealth to below poverty level. I said that it was hard, but I felt that my husband and I were doing what we needed to be doing at this point in our lives. I was grateful that we lived in a community that embraced people regardless of income and that there wasn’t judgement about what we lacked. My sharing vulnerabilities led to a woman from New Zealand talking about her difficult childhood after her father died leaving her mother a widow. She spoke about the sacrifices and hard work her mother spent to raise her and her sister. I asked if that had impacted the way that she made financial decisions. Was she afraid of being poor like that again? She said that she and her husband owned their home free and clear. They had never gone on expensive vacations, and never had a lot either. She wanted to make sure that her children always had a roof over their heads. I told her how wonderful it was that she could make those decisions and help her family. 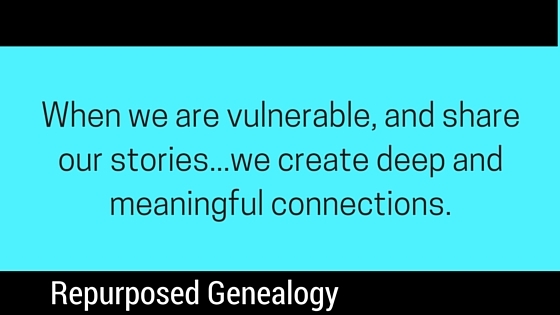 When we are vulnerable, and share our stories… not just the surface parts of life, we create deep and meaningful connections. We stopped at a hotel to let some of our group out of the van. One of the men in the van mentioned that he was living in another country where he didn’t speak the language. Her words slapped me, and I apologized. “I wasn’t trying to charge you a nickel or anything. ” It was a reference to a Peanuts cartoon, and my attempt at levity. She must have seen the stunned expression on my face through the shadows in the van. She said she was just joking, but I didn’t see the humor. No one laughed. As we pulled up to the next hotel, I asked where we were, said goodbye to the other bloggers in the van, and got out. I didn’t know where I was. in relation to the hotel I was staying at, but I needed to escape. I barely made it around the corner. I didn’t want her, or anyone else to see me cry. I didn’t want her to know how much she had hurt me. But she had. A lot. She had shamed me after I had been vulnerable and honest. I sobbed the whole walk back to my friend’s house. I had been vulnerable, and been rejected… again. I was mad at myself for trusting her with my story. I’ve thought about that night a lot since then. Would I change how I responded? Why did she say that? Did I share too much? I’ve realized that the why doesn’t matter. I’m not good at pretending I care about things when I don’t. You might love your cat like a person and throw him birthday parties you invite neighbors to. I’ll nod politely when you tell me about it. But, I won’t be coming to the party because A) I don’t really like cake and B) It’s a party for a cat. By being vulnerable and sharing my story, I feel connected to you. I get hurt sometimes when I’m vulnerable, like that night in the van. Most of the time, I am rewarded. You share your vulnerabilities with me. I cried when I saw the email last week. It was a sobbing, ugly cry like that night after the van. Except, this time, my crying was accompanied by overwhelming joy. My blog post was being featured on WordPress Discover. I had met the biggest writing goal I set for myself this year. I’ve asked my friends for advice about approaching this first blog post after being featured on Discover. They overwhelmingly said to be myself. I’m Genealogy Jen, but I’m not a typical genealogy blogger. I do Repurposed Genealogy. I write at least one blog post per week. On the first of every month, I write for Hoagie’s gifted education. At least once a month, I’ll share a fun craft or DIY project. Sometimes, I’ll write about one of my 40 fears, something I’m passionate about, or a painful experience. Or, I’ll just write about something random. I have a weekly challenge for you to work on with me at the end of most of my posts. Welcome to my newest followers who are WordPress writers from all over the world. Thank you for following me, and helping me reach my final 2016 blogging goal. Thank you for traveling with me on my journey. I can’t promise that I will always write something you will want to read. I promise you that I will be honest with you, and tell you my truth, and my story. That’s also what I expect in return from you. No one can tell your story the way that you can. It’s your truth. Here’s a Free 4×6 102 x 152 mm (I converted it to metric for you. Is that helpful? ) printable to hang where you write as a reminder. Free printable. Do you. 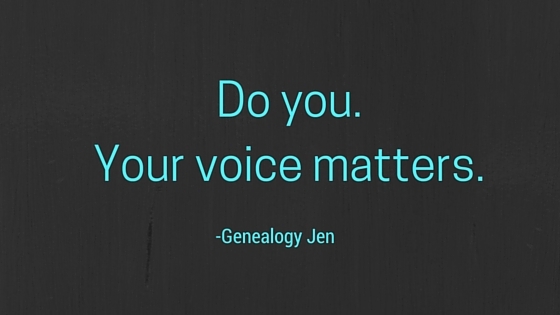 Your voice matters. And hey, it’s cuter than a post-it note right? Genealogy Jen’s Challenge of the week- You know that thing? The one that you haven’t written about, because you don’t know where to even begin? The story you’re afraid to tell because it’s so painful? Start writing it today. It doesn’t matter if the words flow. You don’t need to publicly post it on your blog if you’re not ready. But, your story needs to be told. Let it out. Bonus Points- Be vulnerable. Sometimes, you just need to hit publish. Comment and share a link for us to read. Thanks! I don’t know why. I am choosing to believe that she was not malicious in her intention. Some people are really uncomfortable around others who are emotional or vulnerable. I gravitate towards genuine people. I value authenticity, and try to be real. Basically, if you’ve met me in real life, I’m the same as I write. Except -I might crack more jokes in person. I just started using WordPress and Discover is how I found your blog. Already, your stories have touched me, especially the one about self-image and weight because that’s something I could personally connect to. I’m so happy you could open up and be vulnerable because you made an impact on me as well many others, I’m sure. It’s possible the other blogger, who’d just moved to the new country and didn’t speak the language, really did feel lonely and wanted to talk about it, and felt intimidated after the other woman’s awful remark. I’m sorry she shut it down like that, I agree with thegeneologygirl, she must have felt threatened or something. I would feel lonely not speaking the native language of a country I lived in. I felt lonely moving to the rural mountains. It made me realize that 1. I can’t trust people who aren’t honest with themselves. 2. I’m still afraid of sharing too much information with people, and having this happen. 3. It can’t stop me from sharing anyway, because that’s how I grow the most. Loved this. Being honest and vulnerable is what makes blogging so great because then friendships are made. I’m glad to be a friend from Canada! Don’t worry about that lady, she doesn’t get it and probably never will. Congratulations on being featured on Discover! Enjoy every second of it! I have. It has been amazing, and super scary too. But mostly amazing. Thanks for setting the bar so high for me. I just am so dang proud of you…realizing this goal, and seeing how you have touched so many random people who now think of you as a friend. I am truly blessed to have you in my life! Thanks Deb! The feeling is mutual for sure. I’m proud of you for leaving the van. What a rude comment! I wonder if sometimes others insult us because of our honesty. Keep being you, Jen. You created a boundary. Good on ya! And next time when you leave someone who is rude, pat yourself on the back and grin. Boundaries are healthy. Small talk and superficial pleasantries waste valuable time that I can get to know a person. I’d much rather cut through the meaningless talk about weather to get to the real person behind it. I have created better boundaries for sure Janet. Thanks for reminding me of how much I have grown. The old me would have sought approval or redemption from her. Not my monkey not my circus. Maybe us being genuine and authentic is a reminder to them of the connection they are missing by keeping things superficial? My cousin said that you know you are on fire, and doing well when the haters show up. I’m going to try to remember that for sure. Hugs! Awesome!! Thanks for being so open and honest. More people should try it. Wonderful! Welcome to blogging. I loved your poem. Glad to hear it Reeanna Lynn. Do you! I don’t know what’s wrong with people, to be so negative. I was raised with the idea that if you don’t have something nice to say, then say nothing. That phrase was changed slightly in our house hold to be “if you don’t have something nice to say to strangers then keep your mouth shut”, after all only your family should have to put up with a poor attitude. That lady has her own demons and good riddance to her. I like that you got off the bus, she didn’t deserve your lovely presence. That lady was mean and I am so sad for your going off to cry! I’d probably go off and cry about it too! I agree with the other reader who wrote that the lady probably felt threatened. Oh Joey, thank you for having my back! Love it!! My favorite part is about the cat party. Haha, so true, and I’m with you in this one for sure, you have explained this so eloquently. Also, you are so right, being vulnerable can get you hurt once in a while but the rewards far outweigh, and a lesson I am learning and doing better at, (one of those works in progress that takes a lifetime to achieve). One more comment. I’ve been open and honest and generally been myself with my boss and it has gotten me in a place of crying in my hotel room or in private because he is disapproving of me. We have cultural differences I believe. I’ve since clammed up and act like a robot and our relationship is much better. Just an interesting comment I wanted to point out, I agree with being genuine and yourself but there are sometimes exceptions to this in certain situations. There’s definitely a time and place Molly, you’re right. I just long for deep and meaningful connections. The small talk pleasantries grow old.